Last spring, Shoshana Walter with the Center for Investigative Reporting filed a routine public records request with the Sacramento County Sheriff’s Department for a story on a rogue firearms instructor. The request was unceremoniously denied, so Walter did exactly what reporters do in that situation: she pushed back. Moments later she received an email that she was never meant to see. "Okay, now what? She is being a pain. Do we ask Peter what to do with her?" wrote the public servant handling the request. March 13-19 is Sunshine Week, the season in which open government activists around the country make as much noise as possible about the need to reform laws on access to information, whether that’s the federal Freedom of Information Act (FOIA) or state-level laws, such as California’s Public Records Act (CPRA) and New York’s Freedom of Information Law (FOIL). Journalists, government watchdogs, and regular citizens around the country encounter weak excuses, flagrant stonewalling, and retaliation from government officials on a daily basis. 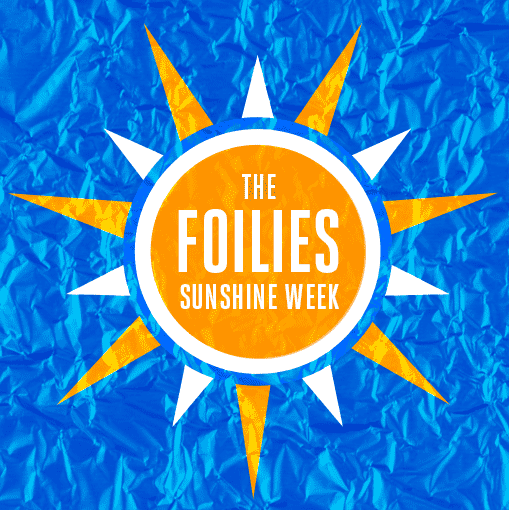 That’s why, to celebrate Sunshine Week, the Electronic Frontier Foundation (EFF) created “The Foilies,” our name-and-shame awards for agencies and officials who stand in the way of transparency and accountability. The homebrewed email server former Secretary of State Hillary Clinton used during her time in office was lighter on complying with the spirit of FOIA than that watered-down lager brewed in your cousin’s closet. And just like your cousin deciding which buddies get to share in the homemade suds, Clinton herself decided which of her emails to share with the public and then deleted 30,000 of them. Transparency advocates and journalists are right to criticize Clinton for using an insecure private email server, but it is important to remember that her story is merely the highest profile example of a public official misusing technology to stifle public oversight. For years, officials at the local, state, and federal levels have been using private communications to shield their work from public scrutiny—New York Gov. Andrew Cuomo has communicated exclusively with Blackberry PIN messaging to avoid creating any records and high-level White House officials used their private email to conduct government business. There are, sadly, dozens of other instances of governors, city councilmembers, and county commissioners doing the same thing. When officials use private communications for work they are not just potentially violating open records laws, they are stymieing the public’s ability to understand operation of their elected government and to hold those officials accountable for their actions. Clinton deserves this award, but so does every official who seeks to hide his or her actions from the public by using private communications systems. Shawn Musgrave exchanges emails with Rowan County Clerk Kim Davis from an Airbnb rental while attending a police accountability conference in Riverside, Calif.
Last year we issued this award to the Drug Enforcement Administration for asking for $1.46 million in fees to process a FOIA request related to the capture of Mexican drug lord Joaquin “El Chapo” Guzman (and that’s even before he escaped, was interviewed by Sean Penn, and then recaptured). New Mexico media outlets have been battling against Gov. Susana Martinez’s stalling tactics with records requests basically since she was elected to office in 2010. Yet, when it comes to her own requests for public information, Martinez is a little impatient. The United Kingdom also has a Freedom of Information Act, and last year a new body was formed to review the state of play (read: investigate whether transparency is too expensive and invasive). But at its first meeting in 2015, the Independent Commission on Freedom of Information announced a ludicrously ironic set of ground rules for reporters. As The Guardian reported, the meeting would be “off-the-record” and journalists could not quote anyone. Transcripts weren’t published either. The U.S. Army wasn’t happy with New York Times reporter Dave Philipps’ investigation into concussions at West Point. As documents show, Army officials came up with a plan to undercut his story by stalling the release of FOIA documents until they could publish their own report. What’s worse is that this wasn’t the first time they’d pulled this trick. As Army surgeon general Lt. Gen. Patricia D. Horoho said, according to a meeting summary, “Timing is everything with this stuff. We were able to do something similar...when the Colorado Springs Gazette attacked them with treatment of wounded warriors last year—killed any scrutiny from the media and killed their story." Miami Herald reporter Carol Rosenberg has been covering Guantanamo Bay for more than a decade, and that’s how long its taken the Department of Defense to release information on the costs of running the offshore detention facility for enemy combatants in the “War on Terror.” In 2004, a DOD official started compiling answers to her questions, but later informed her he was under orders not to release the information. So, Rosenberg filed a formal FOIA request in February 2005, received a rejection, and then appealed. In 2015, almost 4,000 days later, she received an apology for the delay and a decision that the secrecy was unwarranted. She received three pages of information that showed the tens of millions spent to maintain the controversial facility in its first years. The Houston Chronicle was researching a reported spike in crime along the Mexican border by filing Open Records Act requests for crime data with sheriffs across south Texas. None of the sheriffs asked the Chronicle to pay records fees, except for one: the Willacy County Sheriff provided reporter Brian M. Rosenthal with an itemized invoice for $339.60 that included—wait for it—$98.40 worth of Wite-Out. Based on Staples pricing, that’s a full 55 bottles worth of redaction or one bottle of Wite-Out per 18 pages of responsive documents. This year, we received three separate nominations in which FOIA officials were absurdly mindful of the privacy of animals. Reporter Elizabeth Dinan found on at least two occasions that the Portsmouth Police Department in New Hampshire were redacting the names of lost and loose dogs from its blotters. Meanwhile, MuckRock contributor Carly Sitrin found that New Jersey initially refused to release the necropsy results for dolphin that died in the South River, citing the dolphin’s “medical privacy.” NJ later reversed course. The prize, though, goes to the Oregon State Legislature, which renewed a law exempting the names of people who sell laboratory animals to Oregon Health & Sciences University, ostensibly to protect vendors from overzealous animal rights activists. InvestigateWest reporter Lee Van Der Voo obtained records (released seemingly by accident by the Oregon Department of Agriculture) that illustrated the pitfalls of shielding an industry from scrutiny. As it turns out, one of the primary primate dealers to the university had previously served time for illegally smuggling orangutans as part of the infamous “Bangkok Six” case. The Sacramento News & Review filed a public records request with the city of Sacramento for communications from Mayor Kevin Johnson’s office regarding how the former basketball star and his staff allegedly engineered the collapse of the National Conference of Black Mayors. The City Attorney agreed the emails were public, but then Johnson’s legal team threatened to file a lawsuit against SNR unless they abandoned their quest for transparency. SNR refused, Johnson sued, and now the story has been stalled as the case plays out through a protracted legal process. It remains to be seen whether the case will wrap up before Johnson leaves office next year. The Cabinet’s conduct in this case was indeed egregious. The face of the record reveals the ‘culture of secrecy’ of which the trial court spoke; and it evinces an obvious and misguided belief that the Open Records Act is merely an ideal—a suggestion to be taken when it is convenient and flagrantly disregarded when it is not. Redactions are a way of life in FOIA, but a response the American Civil Liberties Union received from the Office of the Director of National Intelligence (ODNI) in September takes this year’s award for most ridiculous misuse of the black marks. For years, the ACLU has been demanding access to records documenting the government’s “targeted killing” program. In ODNI’s response to ACLU, it claimed to be releasing an eight-page letter the ODNI Director James Clapper sent to ranking senators on the Intelligence Committee. That statement was belied by the fact that ODNI withheld nearly every word of the letter, save for the page numbers, names and addresses of the senators it was sent to, and a final concluding paragraph from Clapper. The redactions are so all-encompassing, there is no way to know what the subject of the letter is and whether it actually discusses the targeted killing program. Of course, anyone who attended the trial would have been able to see the records without the DOJ’s redactions, which the DOJ claims were in part necessary to protect law enforcement concerns, despite airing those records in open court. Like the airport security line on a busy travel day, the TSA's backlog of FOIA responses just seems to keep growing. That's according to a compliance review by the Office of Government Information Services (OGIS), one in a series of reports on various agency-components of the Department of Homeland Security (DHS). OGIS found a nearly 70% year-over-year rise in the backlog of unfilled request—up to 924 in 2014—despite a small drop in the number of incoming requests. How does TSA get through those old requests? Unfortunately, it turned to the dreaded "still-interested letter," checking to see if requesters still care enough to want an answer. TSA sends those out after a case has gone unclosed for four years—and, contrary to DOJ guidance, allows only 10 days for requesters to respond. Here’s where the timeline gets bizarre: America Rising filed the request on October 21, asking for communications that were exchanged on October 20. Instead, the city said that America Rising had demanded the request be fulfilled by October 20, one day before the request was actually filed. The city denied the request, essentially claiming they lacked the time travel capabilities to respond. The Electronic Frontier Foundation is a non-profit organization that defends free speech, privacy, innovation, and transparency in the digital world. The Foilies were compiled by Dave Maass, Aaron Mackey, and Parker Higgins of EFF, with assistance from Michael Morisy and JPat Brown of MuckRock News.